Last week I told you about Connor slamming his finger in the car door right? 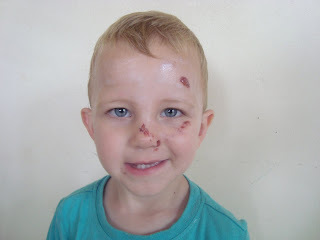 Well on Friday we went to Ant & Kate's for a braai and Connor fell off little Tom's bike & scratched his face on their tar driveway! Shame he screamed when it first happened, but the funny thing was after a few seconds, he was fine!! Even the Debbo's said they can't believe how brave our little boy is! I obviously feel like the worst mom ever letting this happen to him, but I guess boys will be boys!? He'd obviously decided he's way too tired, so he'll just have a cat nap in the back of mom's car. Note how he even put his seatbelt on too - man he's precious! Anyways, on to another topic (feel bad enough already he he he). I think I may have ovulated over the weekend & just hope we managed to get it right!!! Please hold fingers for me. Our building took a bit of a horrible turn over the weekend. Due to the guys trying to level out the 'bottom garden', our retainer wall dropped around 1m!!! So we now have to first rebuild the retainer wall (on a stronger foundation) before we can carry on with the building. It's a bit of a set back, but luckily we aren't in too much of a rush to get it done! Frank got his Bakkie, and he's really happy with it, although it does take a bit of getting used to as it's by no means the Audi! 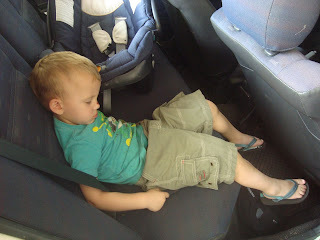 It's still really comfy to drive & Connor loves cruising around in the bakkie! It's only 24 sleeps until we go see the family in Dec - man i can't wait any more!! !